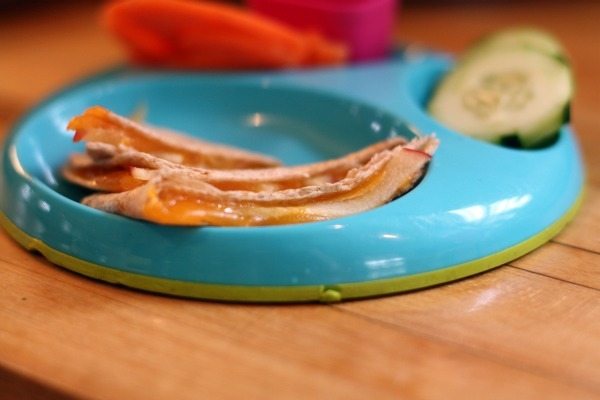 I tried something new for M’s lunch yesterday… and she LOVED it! She’s a big fan of cheese and bread in general, but put it all together in a quesadilla and add her favorite fruit… she was sold! I served her favorites on the side, cucumber slices & carrot chips along with some homemade ranch dip. I felt I had to give her favorites since I was trying something new on her. To make the quesadilla, you wanna take half a whole wheat tortilla, place it on a skillet that’s been heated to med-low heat. 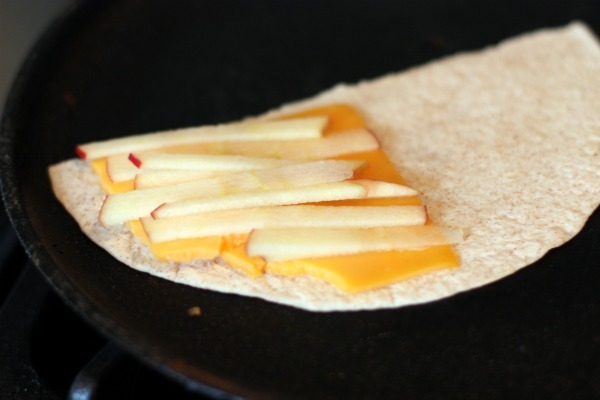 On one half of the tortilla place some cheddar cheese, then top it with thinly sliced apples. 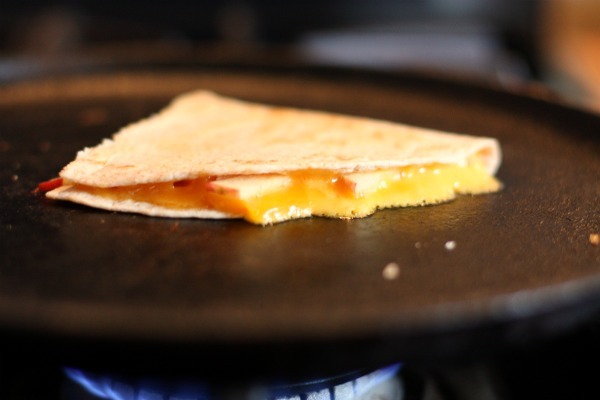 Fold the tortilla in half and cook for a few minutes on each side until the cheese gets nice and melty. Let it cool, then cut into smaller slices. I’ve made something similiar before. Delish- yours look so good! i never would have thought to throw these two into a quesadilla together, but i love it! I want your daughter’s lunches! 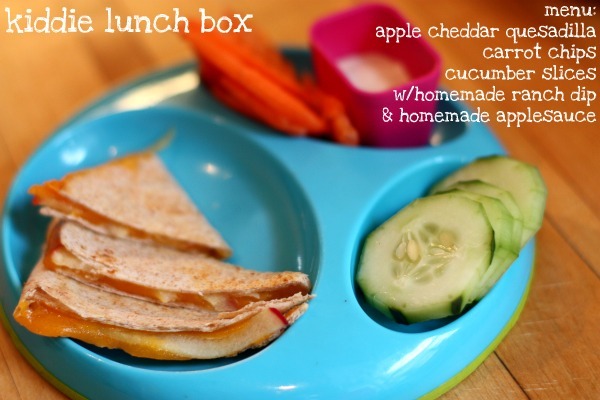 We love apple and cheese quesadillas! I usually use gruyere cheese and a little dijon mustard. YUM. 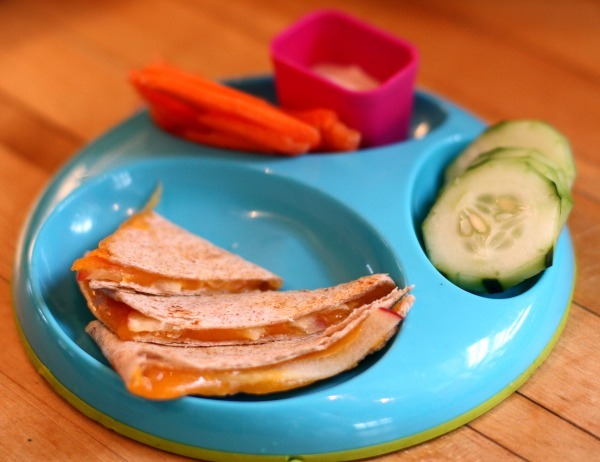 As a kid, I LIVED on cheese quesadillas! Apples in ketchup? I might have thrown up a little. Ick. This, on the other hand, will be my inspiration for my own lunch today. If only I had gruyere because Maryea’s suggestion sounds really good. Oh cheesy goodness…how I miss thee! This looks perfect! YUM! I’m not a huge quesadilla fan but the sweet and savory combo sounds amazing! YUM! I must be a giant kid — haha I loooove eating this as a snack! =) apples and cheese are so perfect together!